The aortic vestibule, or outflow tract of the left ventricle, is superiorly constant along with the ascending aorta. This valve is structurally same to the pulmonary valve. The aortic valve closes the opening from the left ventricle into the aorta. It consists of three semilunar cusps with the free edge of each protruding upward inside the lumen of the ascending aorta. In the middle of the semilunar cusps and the wall of the ascending aorta, there are pocket-like sinuses—the right, left, along with posterior aortic sinuses. Right and left coronary arteries arise from the right and left aortic sinuses. As a result of this, the posterior aortic sinus and cusp are occasionally referred to as the non-coronary sinus and cusp. The operation of the aortic valve is same as the pulmonary valve with one important extra process: When blood retreats after ventricular tightening and fills the aortic sinuses, it is driven automatically inside the coronary arteries, since these vessels emerge from the right as well as left aortic sinuses. Towards the aortic wall the aortic valve cusps connect in a crescent shape, rising to points where adjacent cusps are separated by only a small distance (commissures) and descending to the trough of each cusp. Normally Aortic valve function depends on its 3 cusps, the annular fibrous tissue, along with aortic root/sinuses of Valsalva. The three intersections are spaced peripherally around 120° away from each other and fill the three points of a triradiate crown. 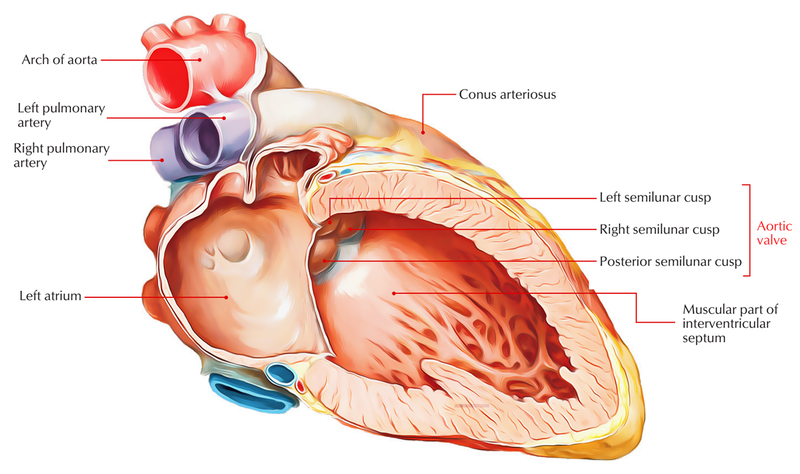 The aortic valve cusps are titled for their connection with the coronary artery ostia; so, a normal valve possesses right, left and non-coronary cusps. The structure of the pulmonary valve and adjacent tissues is same as the aortic valve, with the exception of a thinner structure, deficiency of well-developed sinuses at the back of the cusps and lack of coronary arterial orifices. Before it is pumped out to the body, it closes off the lower left chamber that holds the oxygen-rich blood. From the left ventricle towards the aorta and on to the body, it opens in order to allow blood to leave the heart. In Aortic Valve Stenosis, the cusps of the aortic valve may get thickened and stiff, or they may merge together. This constricts the aortic valve opening. The narrowed valve cannot open fully, which results in reduction or blockage of blood circulation from heart into aorta and the rest of the body. For aortic valve stenosis and aortic valve regurgitation, a surgical process is performed in order to replace an aortic valve. The damaged valve is removed and is substituted with an artificial valve during this surgery. It is usually an open-heart surgery. An option for some people may be a minimally invasive surgery or a catheter procedure in order to replace the aortic valve.